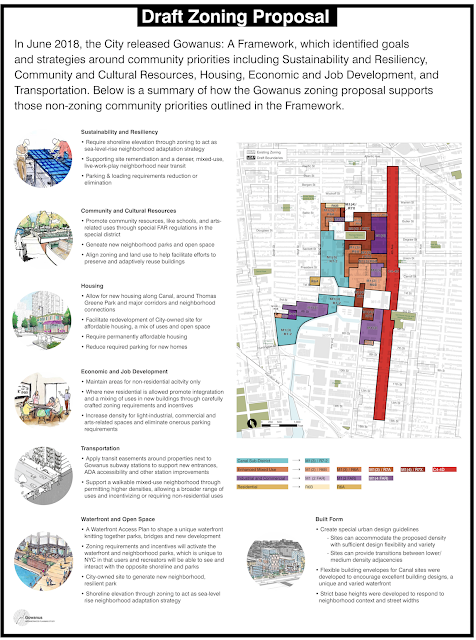 You may have heard already that the New York City Department of City Planning (DCP) released the long awaited Gowanus Draft Zoning Proposal today. Members of the community, who thought that the lengthy Community Listening Sessions of the past few years by Councilman Brad Lander and DCP would result in a contextual, sustainable, sensible, resilient plan, may feel betrayed by this proposal. It seems to cater to developers, not the community. According to Crain's New York, the freshly released Draft Zoning Plan calls for the rezoning of 80 blocks in Gowanus, and "would allow buildings as tall as 22 stories along certain portions near the canal—with one block in particular topping out at 30 stories." "I believe this proposal is a strong next step toward the sustainable, inclusive, mixed-use neighborhood that the community has been envisioning for many years." "I know that not everyone is excited about the idea of new residential and commercial development at heights taller than the surrounding brownstone neighborhoods. But I genuinely believe we are on the way to getting the balance right." Balance? Planning for 22 to 30 story buildings in an area that is prone to flooding is insanity. Bringing thousands more residents to a neighborhood without adequate infrastructure like schools, subways and sewer system, is foolhardy. Moving a rezoning along while the heavily polluted Gowanus Canal has not yet been environmentally remediated and the City has not yet implemented a solution to capture raw sewage flowing into this long neglected waterway, is just criminal. The Department of City Planning will host a public meeting next week. Please make every effort to attend and bring your questions and comments. 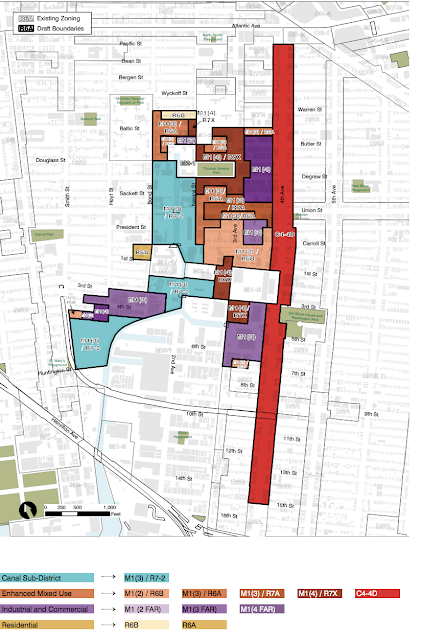 This re-zoning plan will have major implications for Carroll Gardens, Boerum Hill, Park Slope and of course, Gowanus. "Next Steps in Planning for Gowanus"
317 Hoyt St. at Union Street. "Members of the community, who thought that the lengthy Community Listening Sessions of the past few years by Councilman Brad Lander and DCP would result in a contextual, sustainable, sensible, resilient plan, may feel betrayed by this proposal." So if you don't attend meetings pols say you had your chance to have a say and didn't show up so you ceded your voice, and if you do show up pols like Lander do what they want anyway (because they are just gonna run for another office soon) and waste your time. No win. 22-30 story buildings in a flood zone, hurricane evacuation zone no less, is indeed criminal. And so is the assertion that that this is what the community wants. Community Planning sessions were a sham, we knew that as they were happening - that the zoning proposal would end up being this extreme is utterly astounding. The buildings heights are insane. That alone is criminal. Who would live in a luxury high rise looking out over 4th Avenue? This dwarfs Lightstone, which set the tone for this vision. Brad Lander got where he is today because he delivers to developers. .
regarding rezoning Gowanus are so very irresponsible - and very corrupt. Plenty of people will live in tall buildings on 4th ave. They haven't had any trouble filling the buildings that are already there. The two new buildings on Bond st have been filling up. Plenty of buildings in Downtown Brooklyn haven't had trouble finding renters. 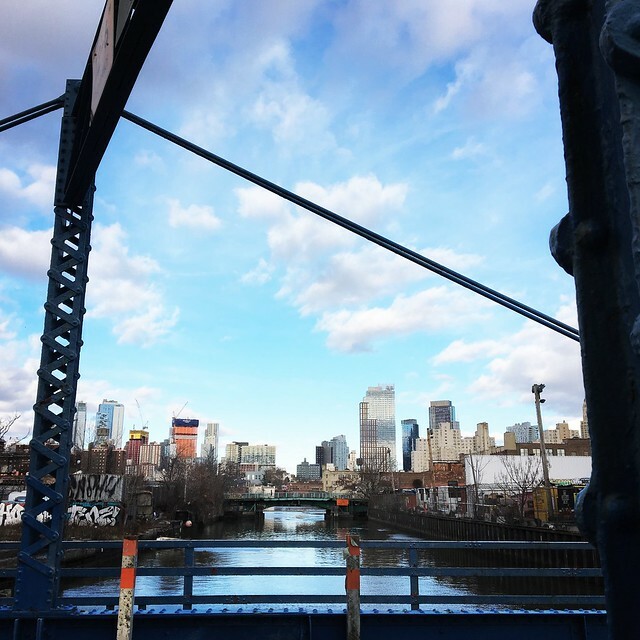 Gowanus is close to Manhattan and it straddles two very desirable neighborhoods, Park Slope and Carroll Gardens/Boerum Hill. I'm honestly not surprised by any of this. People like you are why we have an affordable housing crisis. Developers aren't anxious to build along the Gowanus because it is such a desirable neighborhood -- they want to because they are brownfields, and thus not only with they get a huge payout from the state, far and away above the cost of remediating, which will cover a large portion of building. Then they don't have to pay taxes or 10 years. However, the brownfield rules already require that 5% of housing be affordable. So the expansion here to allow for 20% affordable is larger than it should be. How do we get this info out there? THat we, the taxpayers, are paying for these buildings, seeing our property taxes rise, while developers go without paying any taxes at all for 10 years??? The community no so much? I can't find the community benefit of this plan. What did the community get aside from more affordable housing? Lightstone built at 3FAR density with 20% affordable housing so why is 5FAR density needed now? It looks like 25-30 stories is what will be allowed on Public Place. I didn’t think Public Place was being included in the overall resining and instead was being done separately. In any event, 25-30 stories is NOT what has been presented to the community throughout the years. Notably, this parcel is publicly owned and I thought the community was supposed to have input as to its to future use, not politically connected developers and not-for-profits. Thirty stories on Public Place is outrageous and I think Brad (and perhaps our other ekecteds) have intentionally misled his constituents. I do wish that some of this new development would allow for home ownership but I guess banks won’t provide mortgages for properties on Superfund sites. The city's action is a disgrace, a danger, and an insult to the community. Where is the humanity in all this? The developers get richer, the neighborhood suffers. I'm so very sorry. When I first came to NY 10 years ago I bought a Brooklyn map showing Public Place entirely as a green space. It was given to the city for that sole purpose, a public space. Well that went from public to private really quick! How Brad Landers manages to get elected is beyond me. He is a collaborator and enemy of the community. I have a feeling the 25-30 story buildings were put in specifically to focus outrage, so that when Lander says he negotiated a "compromise" between residents and the city for a height of, say, 15-18 stories, he will claim a win for residents while keeping developers happy, and ready to fund his mayoral campaign in 2021. The F train is overcrowded and service can be sketchy. The R train isn't a whole lot better. The community lost the B71 bus. LICH is gone. Mom and Pop groceries are fading. I see some new sewer pipes are finally being laid around Hoyt and Bond, but basement floodings are still a serious problem. Our schools are crowded. Taxes are going up. Quality services are disappearing as more and more people move in. These developers give nothing and get paid for it! And politicians get their share. What happened to city planning and responsible government. They will continue to close hospitals and allow overdevelopment as long as we vote indifferently to allow it. Where should we build new housing if not in a place like Gowanus? I realize that much of the opposition to development comes from those who own their homes, but, for the other two-thirds of us who struggle to pay ever-increasing rents, the affordable-housing crisis is no mere abstraction - it is a reality that threatens our continued ability to live, work, and raise our families here. @Anonymous Feb 3, 7:41AM: If you think affordable housing is going to be built along the Gowanus, I've got a bridge or two to sell you. It's going to be luxury condos that are built on public property, with a small portion of "affordable" units that only someone making six figures or more can afford. And it will be funded by our tax dollars. We need to disabuse ourselves of any thought that these will be luxury condos. They will be rentals. Banks won’t provide mortgages to properties on a Superfund and lets not forget, they are also in a flood zone. The good news is that those with means will be able to extricate themselves more easily than those with limited options if the disruptions from the clean up, construction, and canal itself become overwhelming. “Luxury” or not, increasing supply brings down the overall cost of housing in the city. Mandating that units be offered at below-market rents is not the only way to create affordable housing. The central issue is that this is in a flood zone (category A). It is not if, it is when, there will be a flood. These new structures would require being built up to protect them from flooding. This will, beyond a doubt, place the homes surrounding this project at great risk. It is not a matter of 'not in our backyard'. You cannot build in a flood zone. Not only will the next flood prove much more harmful to the surrounding buildings, any residual toxicity would flood and be a health hazard. After the last flooding all politicians came out, including Landers, and said they wouldn't let this happen. It is not that people don't understand the need for more housing - but the community also understands that politicians being in bed with developers is antithetical to wise solutions. If any readers are interested in meeting and finding ways to fund (I am happy to pitch in) a preliminary review by an engineer, please comment below. Everyone come to the meeting and consider organizing. It is time to demand true dialogue or we need to resist continued destruction of the spirit of community.